Continual sneezing, a runny or stuffy red nose, itchy ears and throat, hayfever is enough to make your eyes water isn't it? But the good news is that you don't have to suffer through spring and autumn cursing nature, there are steps you can take to ease your hayfever suffering. With this in mind, here are five tips to help you beat your hayfever symptoms and put spring back in your step. The first way to gain control over your hayfever is to find out what is triggering your allergy. To do this you need to monitor when you experience your symptoms. If your symptoms are worse in spring, it could be caused by tree or grass pollen. If it is worse in autumn, it could be an allergy to weed pollen. If you find it's flaring when the weather is warm it could even be a reaction to fungi and mould spores. 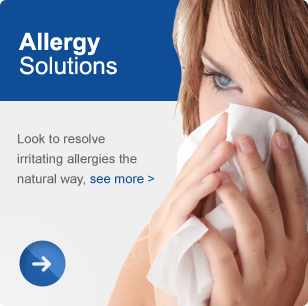 If you aren't sure, contact your naturopath or physician to help diagnose your allergy. Often the hayfever symptoms you are feeling are a secondary allergy and they're presenting because of an underlying allergy or intolerance to certain food you eat on a daily basis. These central allergens as they are often called include foods like dairy products, wheat and wheat products, food additives, coffee, chocolate, citrus fruits, corn, eggs, oats, nuts, gluten, yeast and glucose. Because our bodies are so busy trying to fight central allergens, when another allergen like pollen comes into contact with us our bodies can't deal with it and it causes an allergic reaction. This is why most people find their hayfever dramatically reduces or goes completely when they eliminate the foods they are reacting to from their diet. Allergies are caused when your immune system over-reacts to substances like pollens that shouldn't normally cause you a reaction. Seeing the substance as a threat, your body mounts a strong immune defense against it and it causes an allergic reaction. With the majority of your immune system located in your gut, probiotics can be a great way to bring balance back to your over-reactive immune system by restoring the good bacteria that is often compromised. While they don't provide a long-lasting cure, antihistamines and steroid sprays can help to supress your allergy symptoms and provide temporary relief when it gets too much. By following these tips you will be able to minimise your hayfever symptoms and have them present less often. The key to a long-lasting cure though requires comprehensive identification of your allergic reaction and treatment of the underlying causes. At Resolve Health and Wellness take a proactive approach to finding what is out of balance in your body and, using a range of natural therapies to treat it, put you back in balance.